Seven Wonders of EXPLORATION TECHNOLOGY by Fred Bortz (Twenty-First Century Books, "Seven Wonders" series, available January 2010, ages 10-up) Full color, reinforced library binding, ISBN-13# 978-0761342410. Click here to shop for this title in hardcover at Amazon.com. The first two reviews are in, and both reviewers praise Seven Wonders of Exploration Technology! Quill says: Interested in anything science? This is one book you really need to consider adding to your list! In every age, science and technology have advanced human civilization. From architecture to engineering, medicine to transportation, humans have invented extraordinary wonders. Explorers long ago and today have used technology to navigate, travel farther, and understand more about the world around them. They invented vehicles to carry people and tools to the ocean depths, high into the atmosphere, or even to other worlds. They invented scientific instruments to explore the most distant parts of the universe and the smallest bits of matter. 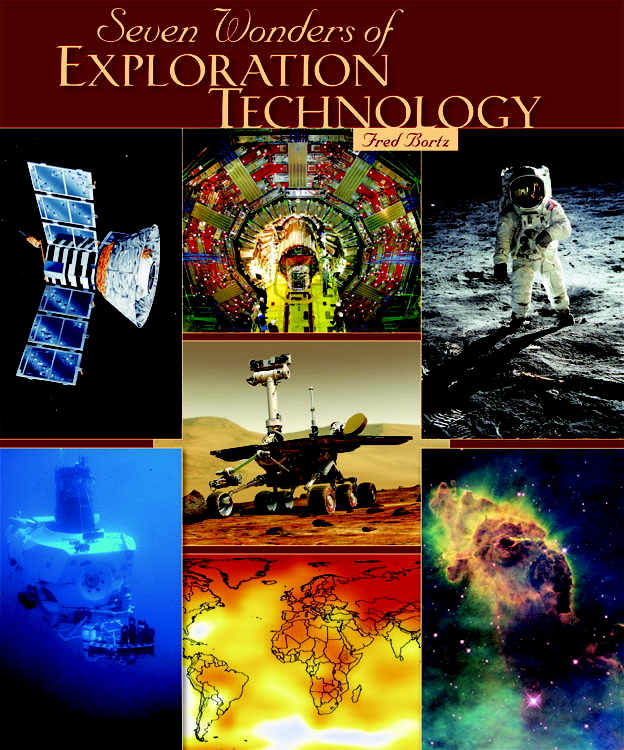 In this book, we'll explore seven wonders of exploration technology. Scientists have developed technology that takes us to the deepest parts of the oceans. Undersea explorations give us a glimpse of a world teeming with unique life and full of wonderful natural structures. Teams of researchers and engineers have also built orbiting space telescopes and interplanetary spacecraft to explore the farthest reaches of our solar system. Back on Earth, scientists have created computers, machines, and systems for studying climate change and the subatomic world. Learn about the people and the science behind these amazing advances in exploration technology. Dedication: To future explorers--follow your questions! Click here for Amazon.com's "Search inside the book" (Seven Wonders of EXPLORATION TECHNOLOGY covers, table of contents, index, sample pages).